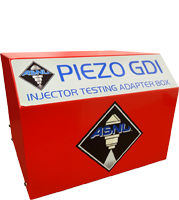 ASNU are manufactures of the world leading Gasoline Injector Diagnostic Testing & Servicing Systems & have distribution in over 60 countries worldwide. ASNU offer a range of systems to suit all markets; Aftermarket Service & Repair Workshops, Fuel Injection Specialist Workshops, Racing Engine Builders, High Performance Tuning Shops, Motor Cycle Performance and Racing Specialists, Motor Cycle Service & Repair Workshops, Marine Racing Performance and Racing Specialist and Marine Service & Repair Workshops. UnPacked: 30Klg Size: L55 W45 H70cm. The 2SGDI system has been produced to drive Evinrude and Ficht Direct Injectors with an ASNU Classic GDI machine.